This post was jointly authored by Lyndon Estes and Tim Treuer. The paper is available here, and an R package containing our data and code is here. Simon Levin’s 1993 MacArthur Lecture was an inflection point in the field of ecology. Synthesizing a decade’s worth of research into scale-dependent ecological patterns and processes, Levin drove home the idea that our understanding of ecosystems is shaped by the spatial and temporal scales at which we study them. The speech went on to become the most cited ecology paper of the 1990s, defining a point after which ecologists became broadly aware that we need to match the scales of our observations to the phenomena we study. But how are we doing at putting that understanding into practice? 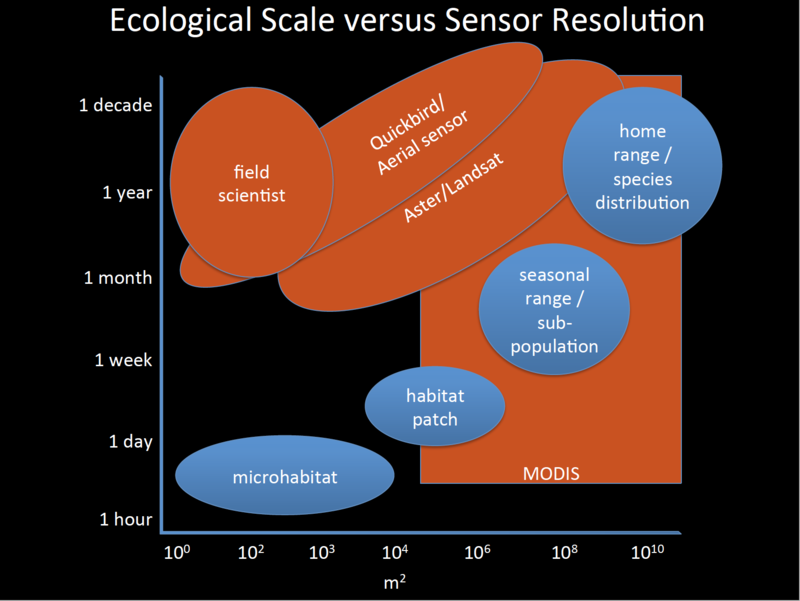 Our ability to measure ecosystems at the relevant scales is often limited by real world constraints—the length of a Ph.D., the resolution of a sensor, the costs of fieldwork. Have these constraints caused gaps in our observations of ecological processes? Our study arose from a clumsy attempt to illustrate such observational gaps. In 2012, I (Lyndon) visited NASA’s Jet Propulsion Lab with co-author Kelly Caylor to explore collaborations on using unmanned aerial vehicles (UAVs) for ecological research. In a presentation of our ideas, I included a hastily sketched figure (Figure 1). Figure 1. The figure behind the paper. My aim was to highlight an observational “hole” that exists at fine spatial and temporal scales, which I argued are practically inaccessible to both field observers and satellites, but not UAVs (Figure 2). After the presentation, Kelly suggested that empirical data, rather than a cartoon, would be a more effective way to illustrate this gap. However, we couldn’t find any studies published after remote sensing became more accessible in the 2000s that broadly quantified the scales of ecological observations. Ironically, there was a gap in the literature about gaps in the scale of ecological inquiry. Figure 2. 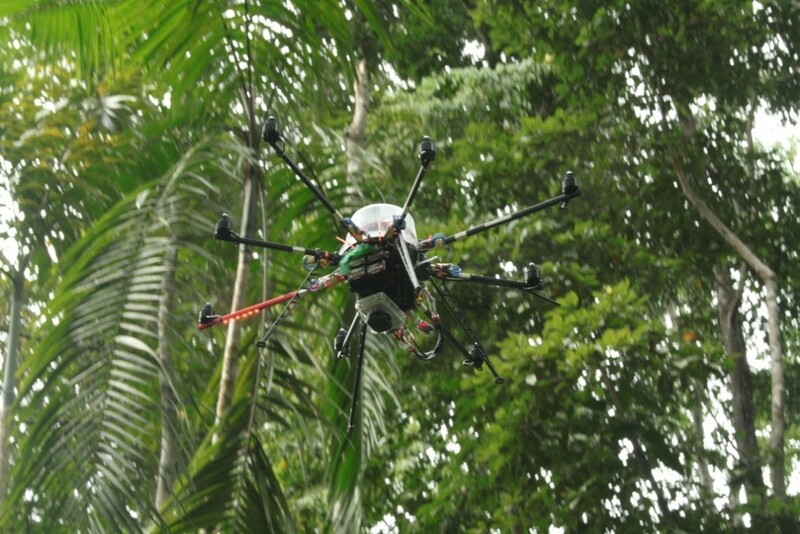 UAVs can collect high frequency, high resolution observations over continuous spatial extents, making them potentially effective tools for closing gaps in the scales of ecological observations. Getting empirical data on observational scales turned out to be a much larger task than initially imagined. It was therefore necessary to find volunteers to conduct the analysis and help write the paper. We managed to assemble a group of 8, which included graduate and undergraduate students, as well as researchers from the GLOBE project, which conducts cross-scale synthesis of case study research. We managed to assemble a dataset that allowed us to examine the spatial and temporal domains of ecological observations, based on a review of randomly selected papers from the most cited ecology journals. After several revisions and some great feedback from our reviewers, particularly Reviewer 3 (the real one, not #reviewer3), we are pleased to finally present this work. We found that 80% of studies still rely on direct, field-based observations, which are relatively short in duration (50% <1 year) and are often temporally un-replicated. Studies that use remote sensing covered much larger spatial extents, while paleo-ecological studies span long durations, but we found that both techniques are used far less frequently within the broader discipline. Although our paper focused on four primary measures of scale (resolution, extent, interval, and duration), we also included two non-traditional metrics, which we call ‘actual extent’ and ‘actual duration’. We define the first as the total area covered by spatial replicates. For example, in a study of forest bird abundance based on 100 point counts, where each point had an observation radius of 100 m and thus area of 3.14 ha (πr2), actual extent would be 314 ha. Actual duration is the total time covered by temporal replicates. If the same bird study recorded bird presence during two 15-minute periods per point, the actual duration would be 30 minutes. We estimated these two dimensions to understand how much time and space ecologists actually measure, as opposed to what they purportedly measure. This in turn allowed us to quantify the differences between the actual and ostensible scales of observation. The average difference between actual and ostensible extent was 5.6 orders of magnitude, whereas the difference between actual duration and ostensible duration was 3.4 orders of magnitude. Whether or not these differences should be concerning depends on the questions and topics of each individual study. For us, these differences make us focus on figuring out how to use new observing methods and technologies so that we can more effectively observe ecological phenomena across large spatial and temporal scales at fine resolutions. One of our most consequential findings arose from the challenge we faced in extracting our dataset. As mentioned above, this project was much lengthier than initially anticipated, simply because most papers did not clearly report their observational scales. In some cases, it was easy to extract the spatial and temporal metrics from the papers we reviewed, but we typically had to estimate these values. This made it necessary to develop a clear and consistent scale estimation protocol, including a time-consuming process for refining and calibrating that protocol amongst ourselves. The upshot was that it took significant time to extract scale estimates, and our estimates inevitably contain errors. Given these difficulties, which speak more broadly of the challenges that incomplete methods sections pose for replicability, we recommend that ecology journals implement reporting standards for observational scales. The good news is that some journals, such as Global Ecology and Biogeography, already do this. There is other good news. Despite finding that most ecological observations are narrow and brief, our analyses suggest that study extents appeared to increase during our 10-year study window, likely due to increasing use of remote sensing. Furthermore, >12% of observations were made with high frequency, automated in situ sensors. These results suggest that we are making progress in filling in gaps in the scales of our observations, and we expect even more rapid progress in the next decade.